Driving Lessons from professional driving instructors in Livingston, Bathgate, Broxburn, Armadale, Linlithgow, all of West Lothian. lessons in Aberdour, Anstruther, Auchtermuchty, Ballingry, Ballmullo, Bowhill, Buckhaven, Burnt Island, Cupar, Kincardine, Methyl, Rosyth, Cardenden, throughout Fife from our Fife based instructors. Livingston West Lothian. Patient friendly male and female driving instructors, learner drivers, learning to drive, the driving test, Lady Driving Instructors, in either a manual or an automatic transmission car. Welcome to The Smart Way website, home of one of the premier Driving Schools in the West Lothian and Fife areas! We offer a wide variety of driving tuition and driver training services, priding ourselves that we always conduct our business in a wholly professional manner. A Full range of structured practical driving lessons for learner drivers in either manual or automatic cars. Female driving instructors for those who would prefer to have their lessons from a lady driving instructor. Instructors with specialist training to enable them to give the best possible training to students with Asperger Syndrome or Dyslexia. Post L test training for those who wish to save money on their first years car insurance and improve their driving including the Pass Plus course. Welcome to our newest instructor, Bobby Wade. Bobby has recently joined us and will be conducting manual lessons throughout West Lothian. Advanced driving training for qualified drivers looking to gain further driving qualifications such as the RoSPA, IAM or Diamond advanced driving tests. We can run bespoke Corporate/Fleet driver assessment and training, ranging from driver risk assessment, defensive driving courses, through to eco driving techniques to save fuel and money. Working with me, are Mandy Cochrane, Colin Slight, Colin Tait and our most recent recruit Fiona Kerr. 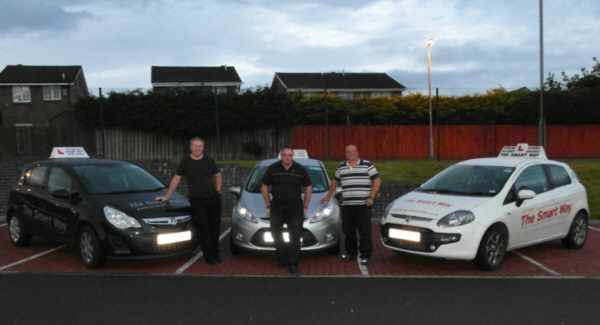 Fiona, Bobby and Colin Tait will provide driving lessons in West Lothian inmanual cars. Fiona is able to provide lessons to students who would simply feel more relaxed being taught by a female instructor, although due to demandher diary is currently full. Colin Slight is our instructor based in the Fife area, he also holds the coveted NVQ Level 3 in Driving Instruction. He will give driving lessons in Rosyth, Dunfermline, Inverkeithing and the surrounding areas in Fife. We would like to extend our best wishes to Mandy, who continues to recover from some complications following the birth of her baby. When the demand is high enough we also run unique evening class theory test courses for those students who are struggling with (or are afraid of) the theory test. These night classes have been well attended in the past and The Smart Way of structured learning has paid dividends. Compared to a national average pass rate of approximately 63% the first time pass rate among our students who attended this course rose to 92%!Anyone can attend these night classes, you don't have to be a pupil with The Smart Way driving school - all are welcome, and we promise NOT to pressure you into taking lessons with us after the end of the course. Of course, if we have impressed you, then we ALWAYS welcome new students. These classes are usually held in local adult education centres in Livingston. For more information on these courses, including start dates of the next course, click on the Theory Test Evening Classes link in the navigator bar to the left. I would like to take this opportunity to thank you for visiting The Smart Way website and for reading this far. Please look around the rest of the site to see what we are about and what we are up to. I hope that you have found the experience to be both informative and helpful.